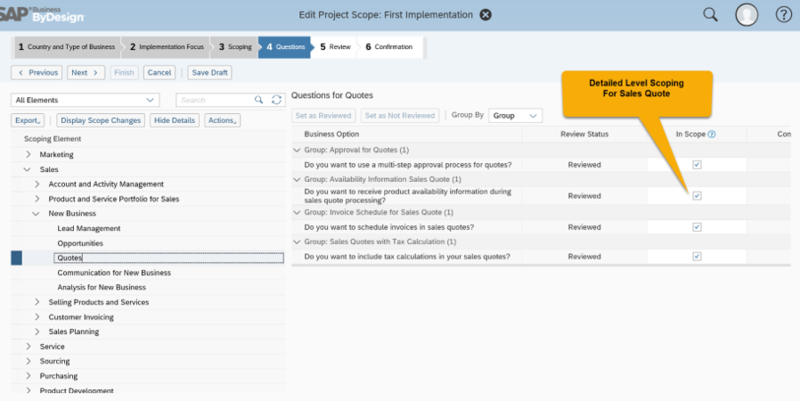 In this document, I would be covering the Available-To-Promise-Check functionality in SAP Business ByDesign. 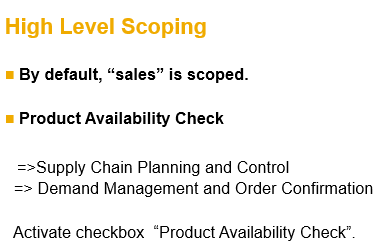 The availability check “Available-To-Promise-Check” (ATP check) is a process that is active in the area of warehousing and procurement planning in SAP Business ByDesign, in order to be able to release goods and products in the required number at the desired delivery date. How much of the requested goods are available and can be promised at what date to the customer. The result of an ATP check is a confirmation – consisting of a source of supply, confirmed quantity and confirmed dates. The ATP check can reserve the confirmed quantities until the corresponding customer demand is saved. The ATP check can consider stock and different types of demands and supplies to calculate a confirmation. The system allows you to check the availability for sales orders, service orders, stock transfer orders, project stock orders, and sales quotes. Green: The required quantity is fully confirmed on time. Yellow: The required quantity is partially confirmed or late in time. Red: The required quantity is not confirmed or an error occurred. Grey: No ATP check performed or confirmation pending. In Scoping, the following business configuration options are needed to activate ATP function. If needed scoping option is not selected, ATP will not be triggered. (status “grey”). 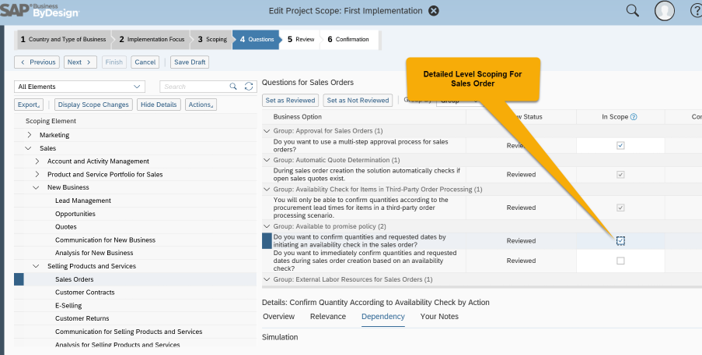 The Product Availability Check Method is defined by combinations of product supply planning area. 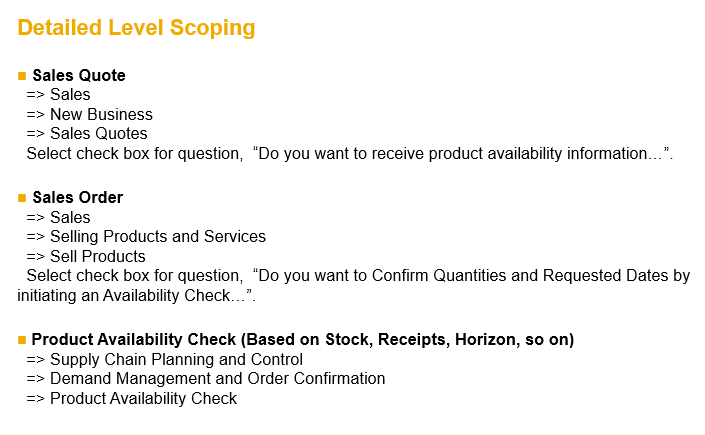 Availability Check Horizon – The system matches the demand against the types of supply specified in the availability check scope within an availability check horizon. Examples for the types of supply would be stock, or stock and all receipts. Availability checks with availability check scope, horizon, and replenishment lead time The system matches the demand with the types of supply specified in the availability check scope within an availability check horizon you specified. Examples for the types of supply would be stock, or stock and all receipts. Beyond the check horizon, the system creates or updates the confirmation based on the replenishment lead time you specified. Further details of these options are explained in the help document. Irrespective of the availability check method you choose, the system always carries out ship-from determination for a customer demand to determine possible sources of supply and schedules the demand to determine the dates that are required to plan the goods delivery. Starting from the requested delivery date, the system takes into account the shipping duration to determine the requested shipment date and uses the goods issue processing time to determine the requested execution start date. Sales Orders shall be delivered according to the availability with an in-time Release to Execution; ATP confirmations for ‚today‘ are automatically released to execution. In a service order pick-up scenario, the goods are not delivered to the customer. Instead they are picked up by a service engineer at the internal site. The delivery rule is fixed set to „Single On-Time Delivery – Full Quantity“ – That way it is made sure that all goods are available on site when the service engineer wants to pick them up. Sourcing – The address of the ship-to is used to determine a transport zone for sourcing. Only sites with a logistics area with storage control „Movable Storage“ are allowed as sourcing result. The TPOP process is initiated if the sourcing step during the ATP check selects a purchasing contract or a procurement price specification of a supplier. The supplier sends the goods directly to the end customer. In that case the ATP check creates an optimistic confirmation, that is a full confirmation on the requested delivery date. Since the delivery of the goods is done by a supplier and not in the ByD system, we cannot do a product availability check. No shipping date is calculated because the goods are shipped by the supplier. Instead a planned ordering date is calculated. This is the date when the resulting purchase order has to be ordered. Sourcing does only check if a transportation lane exists between the two sites. No addresses and transport zones are used in this sourcing step. The ATP check is performed according to the ATP setting of the material master, like it is done for a normal sales order. What does it mean if the error message ‘Source of supply cannot be determined’ occurs? Which transportation zones exist for this address? Which transportation lanes exist between the transportation zones and the ship-from sites? Belong all possible ship-from sites to the selling company? Check in Work Center ->Sourcing and Contracting‘ if there are contracts for the product. 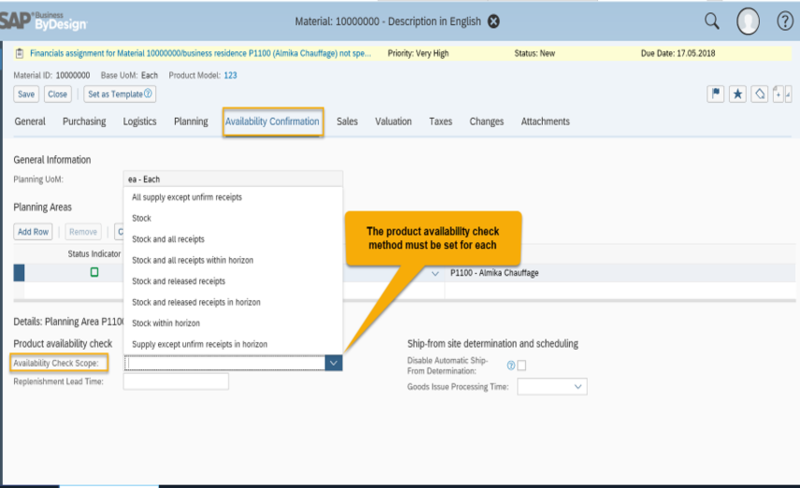 Cause 1: In product master data the availability check method is not defined in the planning area. Cause 2: The error occurs due to the inconsistency of the Requested Date maintained for the Kit Header and the Kit Items of the sales order. Cause 1: Business Configuration Scoping options not selected. Check Business Configuration selections as explained in the master data. Cause 2: The Respective Planning Area is not activated in the Product Master -> Availability Confirmation tab. we have explained the use of Automated runs – Confirmation Update Run that help to execute the process automatically in the background and users can work on other processes in the foreground during the same time. Hence, this increases user’s productivity. Please refer to the blog. Thanks for explaining all the ATP scenarios.